Win a signed copy of Vivien Leigh: An Intimate Portrait! Hi, everyone! The UK publicist for Vivien Leigh: An Intimate Portrait sent me an advance copy in the post and I’m so excited to finally be holding it in my hands! Five years from idea stage to finished book – it feels surreal! I couldn’t have done this without the support of Vivien’s fans here and elsewhere on the web. To say thanks for helping to build and sustain this great community, I’m teaming with Running Press and Perseus to give away three FREE signed copies! There are several ways to enter, as listed above. The contest is open to entrants worldwide and will end at midnight on October 10, the date of publication in the UK. So far, advance reception of the book has been really positive. Kirkus Reviews called it “a worthy tribute to this eternally fascinating star.” That’s encouraging! Not long now until it’s in bookstores! How I waited for a Vivien Liegh book, all dedicated to her! And I have been a Vivien fan since my childhood with Gone With The Wind. Please, Kendra, choose me. I’m so far away from UK or USA and it’s impossible for me to buy the book cause I can’t import anything. I have no International card because my month salary is so little, they don’t allow international credit card for low salary ones. The winners will be chosen at random, so there are no guarantees. However, you can better your chances of winning by doing all of the things listed under ways to enter. Good luck! I am so looking forward to this book! Thank you for writing it and sharing with us. Can’t wait to read this book! Fascinating book about a fascinating woman! Thanks, Carol! I agree, she was a fascinating woman! Sooooo very excited about your new book finally coming to publication! It is BEAUTIFUL!!! And living in Georgia makes it even more celebratory as we see Vivian Leigh in the museums here about Gone With the Wind! I can’t WAIT to read it. What a GREAT coffee table book too! But only AFTER I keep it on my bedside table to READ EVERY NIGHT!!! You should definitely have the museums sell your book in their bookstores. They sell soooo much memorabilia there. Let me know if I can help you in any way. There are two stores/museums here. Thanks, Kathy! I hope to go to Atlanta for the GWTW celebrations next year. I think it’d be a really great opportunity. I’m not sure about it being stocked in the museums in Atlanta, but if it isn’t, perhaps you can request that they order some copies? I’d encourage everyone to do this with their local bookstores, anyhow. It’ll be in the big chain stores but independents deserve all the help they can get. Ahh, this is incredibly exciting!! Aww, thanks, Mariana! I’ve really appreciated all your support over the years. You’re amazing! Would love to win as I’m strapped for cash at the moment but if I don’t that’s fine because I will definitely buy it at some point. I’ve followed your blog and journey for such a long time now and your dedication to your work is inspiring, congratulations on the book! Congratulations on finally seeing all your hard work and dedication come to fruition with the book! I look forward to reading it and mulling over all the lovely photos! No matter if I win or not, I still will be getting the book.. and later forwarding it for signing! I can’t wait to read this amazing book, I love Vivien Leigh! I fell for Vivien as a girl, when I saw her for the first time in “Gone With the Wind.” Of course, I didn’t realize it then. . .I only knew her as Scarlett. I became a real admirer when I saw her again in “Waterloo Bridge.” There was something about her; she looked so small and delicate, yet she had such a commanding presence! A cocked eyebrow was the only warning. . .she could unleash such a storm, when provoked! I admire her fire, and her immense talent. I’m hoping to win the book (which is much larger than I expected). This serves as the necessary blog comment, does it not? Thank you! Would LOVE to win a copy of this book. I have been a fan of V.L. since I was a little girl….I watch GWTW at least once a year just to watch HER act…. I’ve loved Vivien since I first saw her in GWTW when I was 8. It’ll sound silly, but I always was a little embarrassed about having dark hair – everyone seemed to like blondes, I was a long way from that. But when I saw Vivien as Scarlett, all fire, intensity, and determination – not to mention quite popular with the male population – it made me think that maybe being a brunette was pretty great after all. Here it is sixteen years later, and I’ve come to love and respect her in her own regard for her sharp intelligence, her courage, her will, and of course her talent. Depression runs in my family, and I’ve seen what it does to myself and my loved ones; and when I think of what it must have taken for Vivien to push herself out on stage, or into crowds of photographers, day after day, and carry on so dazzlingly, I’m humbled. She’s one of my oldest heroes, and I’m so grateful that you’ve written this book because I know you’ll do her justice. Congratulations, Kendra. It looks beautiful – great cover design. Can’t wait to get it. Vivien Leigh is one of the greatest actresses of all time. She could play any role, and finally there will be a beautiful book all about her! Well done on getting published! I’ve been following you on vivandlarry’s Facebook page for years now and always read your posts – something I never do for other Facebook pages! 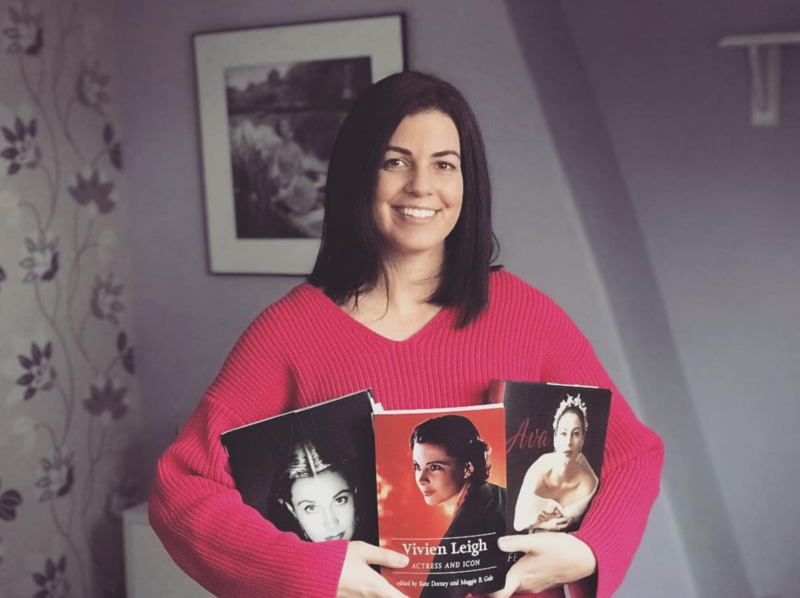 Just wanted to say congratulations and am so excited to order your book as I’m a huge Vivien Leigh fan and it’s nice to know the personality and thought process that went behind such a work :) All the best in life and for any future projects! I remember reading Anne Edward’s Biography about her as a child at my Granny’s house, which definitely sparked an interest.. I enjoy your daily facebook posts and am looking forward to reading your book. Many congratulations, I’m so happy for you! I can’t wait to have it in my hands. I love the design and that electric blue typeface in the cover. Congrats for your accomplishment Kendra, I admire you so much. I am an “old” college prof . . . I saw GWTW at age 13 at a Drive-in with my older brother & sister and have loved Ms. Leigh ever since. That same summer I read the book! Big task for a 13 year old. To win a signed copy of your book on her life would be great! If not, I will buy it! Winning would be much better . . . I love Viv’s defiant spirit. Her and Olivier were an unstoppable couple in their time and I am fascinated by them. I can’t wait to read their story with her context in mind. Congratulations my dear, such a great accomplishment! Looking so forward to reading it! I have followed the process of creating this book with great excitement and interest. As a lifelong fan of Vivien Leigh, I can’t wait to get my copy! I tried tagging you in a post on twitter and I can’t get your name to come up on the hash tag. Congratulations Kendra! Can’t wait to see your hard work in print. I’ve been waiting for this book and praying for it to be published as well)) a good and honest book by the most dedicated fan. i think Vivien would be touched and extremely proud, congratulations! It sure looks like a fantastic book! Very worthy such a stunning actress as Vivien! Absolutely CAN’T wait to read your new book…Seems like the wait has been forever! Love your passion for Vivien Leigh. She is my favorite actress ever. Her personality and illnesses enhance the mystery that has intrigued so many during her lifetime and afterward. Hi, Kendra. Exciting that the publication date is almost here. Talk of review copies made me check the Strand Bookstore when I was in NYC last Saturday, but I didn’t spot anything yet. Will you have any readings or signing in the greater New York City metropolitan area? I hope so. It would be fun to get an “in person” autographed copy, even if I win a free one (a perfect gift item for birthdays and holidays, of course!). Congratulations again! I too am looking forward to this book. If I don’t win it in the contest, it will be on my Christmas list…if I can wait that long. Congratulations to Kendra on a job well done. Kendra, you inspire me as I undertake writing and research projects. I am sure you know how daunting research can be sometimes, especially coupled with the unknowns of the publication process. Come to HB (Bella Terra!!!). I want an authentic autograph from you! So proud of you. Ooooh. That would be fun. Then we can go a post book signing dinner at Hoa Binh! I look forward to reading it – if I won a copy, that would be even better!! Hi Kendra !! Congratulations! so exciting ! I love all the treasures Kendra finds and shares with us. I am happy she is able to study in England and put her knowledge to work. Everyone should be living the dream. Thank you for sharing Viviene and Larry with us and for giving them dignity. T. W.
I’ve been a fan of Sir Larry since I was 18 (many years ago). Since following Kendra on FB, I’ve also become more interested in Vivien. I have heard and read stories about Vivien these last years and am interested in seeing her in a new perspective. Hope I win! I am looking forward to reading this book about my favorite actress–Vivien is such an inspiring person to me! Can’t wait! Congrats on getting your book published, Kendra! I am so happy for you, Kendra (!!! ), and I cannot wait to get my hands on a copy! I ordered it a week after it was available for pre-order, but I would really love to have a signed copy! Vivien was definitely one in a million, I love how strong she seemed to be. I guess you have to be strong when you deal with the things she did in her life. 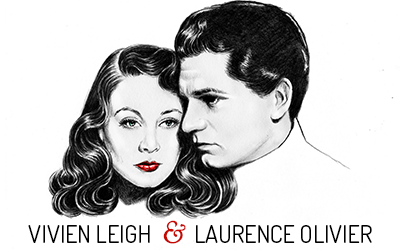 book looks amazing kendra better than any other vivien leigh or laurence olivier biography ive seen before. Pictures look great and exciting, especially of your viv. I’m so happy that I can finally read this book! I was waiting for this for a long time! I’ll give a copy of the girlfriend! She loves to Vivien! Thank you very much for the wonderful chance to enjoy a book about the life of the best actress! Congratulations on your work. Hopefully the book does well. What can be said about Vivien Leigh – Beautiful and a grade 1 actor. is this competition open for international fans? Or at least those in UE? Thanks in advance for your answer. I am looking forward to this book! I am so excited, I’m huge fun of Vivien! Thanks for writing this, by the way! Many kisses from Greece!!!! Congratulations Kendra! I am so excited to read your new book! The cover is absolutely stunning! Thank you for the giveaway!! Hi, I love in Viven Leigh her beauty and the way she acted in GWTW – she was divine! A signed copy would make this book even more fantastic to show friends and family. I would love to show it at our Barnes and Noble I worked at last year! I’m so excited to get my hands on this book, giveaway or not! I’ve followed your site since about 2008, and made sure to stop by 54 Eaton Square when I traveled to England in 2010. A million thanks for the wonderful work you’ve done for us Viv fans. Wow! I really want to win this! Vivien Leigh is the biggest actress of all time! Thanks for this oppurtunity Kendra! Hi, Kendra! I’m happy for you to be publishing this wonderful book, that’s why I sooooo want a copy! Vivien uis a great actress, and has something ethereal in her beauty. I am so looking forward to the release of this book and the product of your incredible research! I love Vivian in GWTW! would love a copy, have loved her since I was a teen. P.S. : Kendra, congratulations on your book and wonderful site. Thank you very much for keeping Vivien and Larry’s memory alive! I’m so excited for this book, I can’t think of anyone doing a better job. The amount of research and knowledge you have collected over the years is going to make for a truly wonderful dedication to an amazing actress and lady. I think Vivien captivated us all in GWTW and then every other film she did secured her status as being one of greatest (if not, in my opinion, the greatest) actress to ever grace the stage and screen and the fact she was impossibly beautiful also is just so wonderful. I can’t wait to get my hands on this book, giveaway or not. Thank you Kendra for finally giving Vivien the recognition she deserves. I can’t wait for this book, it looks beautiful! I’ve been a huge fan of Vivien for several years, ever since I saw her in A Streetcar Named Desire (the first movie I ever saw her in). She’s a brilliant actress and a fascinating person. I’m one of the many who’ve loved Vivien since the first time I saw Gone with the Wind as a kid; as an actress/theater geek pretty much since I could talk, I was already in love with Larry, and the discovery that they’d been married thrilled me. I’ve been obsessed ever since, and keep foisting her other films on friends who don’t know her well (I’ll never believe that Selznick could have seen St. Martin’s Lane and Yank at Oxford and Fire Over England and not even thought she was worth testing…). Beautiful, brilliant, and brave in how she handled her affliction and its effect on her life. Your wonderful blog has given us Viv and Larry fans so much pleasure, and your book looks to be gorgeous, and a worthy tribute to Vivien. I hope to be able to add it to my collection before long — best of luck with it! I’m very excited to have this book on my shelf with my other Vivien books. Beside Marilyn Monroe and Mary Pickford, Vivien is my favourite actress. My favourite Vivien film is Waterloo Bridge. Breaks my heart every time I watch it. I love the strenght of Vivien Leigh. She has been through a lot of difficulties in her life, in love, in her work and with her health. This woman and also her major role, Scarlett O’hara, they are my model for life. I am really excited about your new book on Vivien and can’t wait to read it! Vivien Leigh is on my mind this month with your book coming out plus the fact that I will be going to see Judith Chapman’s play about her in a few weeks. I have ordered your book already but would love to win a signed copy since then I could give Judith one as well. She will be performing her play in Atlanta to celebrate Vivien’s 100th birthday, isn’t that cool? I am going to her Palm Springs show though which is the end of this month. I know she would love to read your book too and I can’t think of a better gift to give her. Both of you have done so much to honor Vivien Leigh. I guess either way I will give her your book, but a signed copy would be awesome so I hope I win! So pleased your book has made it to print Kendra! As far as I’m concerned there can’t be enough literature out there about Vivien. I think what I love most about Vivien is that her personality and talent matched her beauty. So many beautiful stars are rather a disappointment when they act, speak or give an interview but Vivien was so full of life and intriguing and it seems she valued her abilities as an actress above how she looked or appeared. It is refreshing, especially in this looks obsessed age of celebrity, to see someone so naturally beautiful but who so wanted to improve herself, her skills as an actress and as a person. I think that is why Vivien is such an inspiration to me. Congratulations for everything, Kendra! Even if I don’t win the book, I hope that I will have the chance to read it one day, since I am so eager to find out more about Viv’s life. Love your website in general, you post so many interesting stuff about my favorite two actors, and thank you for that! hi kendra, I just want to tell you that I love your site and everything you do about vivien leigh, I hope your book will become a success and come to be sold in more countries, about vivien she was so adorable the greatest actress there will be no one like her, it’s a shame that we are living in the wrong era. Vivien was a wonderful actress and a beautiful woman – I love her feisty character and her vulnerability, which shine through in all her performances. Like many of her fans, my interest in her began with GWTW but has continued through reading more about her life and career. I am happy that so many people still love and appreciate her, and that she is being given the recognition she deserves on her centenary! I’m so pleased for you Kendra. I can’t wait to read it. All your hard work has paid off!!! Thank you so much, Vivien deserves this and so much more. Take everything in and enjoy it all, you deserve so much praise and thanks for everything you have done and do, not just in your book but all the time you spend on the website and your overall dedication. Vivien is very lucky to have someone as dedicated to her legacy as you.